Asus Eee PC 1000HE – Mac Snow Leopard and Windows XP Dual Boot! 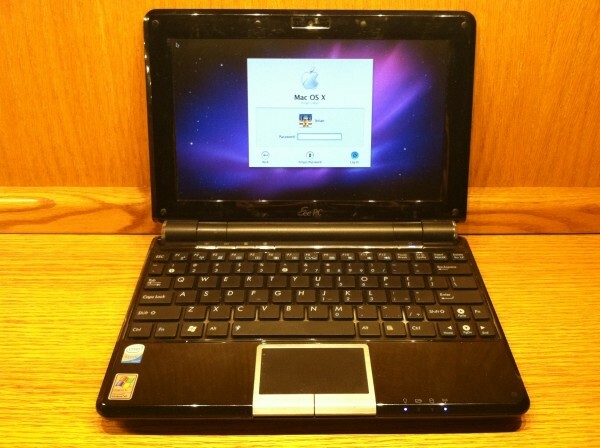 Previously I was able to run my Asus Eee PC 1000HE as a “hackintosh” on Snow Leopard 10.6.0, 10.6.4, and 10.6.7. But I’ve always kept the hackintosh install on a bootable USB drive, as I didn’t want to mess with the original Windows XP install on the 160GB hard drive. I recently purchased a 180GB solid state drive (SSD), and so I figured this would be the perfect chance to try my hand at an XP/Snow Leopard dual boot system. I was warned by a friend that this was more trouble than it’s worth, especially since I had a working hackintosh, even if it was by USB stick. But I had figured I’d have an easier time than he did, since there’s lots of guides specifically written for the 1000HE, while my friend had installed to different hardware. I had some troubles on the way, but I finally got it to work! This guide presumes you’re reasonably computer savvy (though maybe not an expert), including knowing things like how to use F2 upon boot to get to the BIOS settings to select which device (HD/SSD, USB stick, CD/DVD). While you’re there in the BIOS settings, it’s probably also a good idea to turn off quick boot and quiet boot. After the OS X install is complete, install NetbookInstaller 20100616 from Meklort’s Blog (yeah, that link is dead, though NetbookInstaller 0.8.4 RC1 will work here also), selecting only “install Chameleon” and “general extensions” (select “continue” if warned about an “unsupported device”). Reboot to the HD/SSD and go through the first time setup steps. At this point 10.6.0 is bootable, but without functioning Ethernet, Bluetooth, and sound. There was no need to install the kexts to get those working, since I was immediately going to upgrade to 10.6.7 and would need to reinstall those kexts anyway. The next step was to update to 10.6.7. Although will1384’s guide was written based on updating to 10.6.4, the same procedure worked to get directly to 10.6.7. Unless otherwise mentioned below, the kexts and other additional files to be downloaded can be found in Will’s guide. If you’re lucky like me, you have the Atheros 9280 wireless card which works without any modifications. If you have the AW-NE766, then Will’s guide discusses how to download the Ralink drivers to get it to work. Check out Ricky’s post under “sound buzzing fix” if you’re having problems with, well, sound buzzing. I found this information on updating to 10.6.8. Since there is no newer NetbookInstaller to patch this updated kernel, the patching has to be done manually. I went a little bit down this path before deciding it was too much trouble for me, so I stayed at 10.6.7. Boot with the XP Recovery Console USB stick and format the last partition (should be C:, use the DISKPART command to check) to NTFS. Press EXIT from the recovery console, and the system will restart. Boot to the XP Install CD with slipstreamed drivers and install XP to the NTFS partition. Let it automatically reboot to the HD/SSD and do the first time Windows XP setup steps. Right now we’ll always go into Windows XP upon booting. Now we need to set the OSX partition active, as that’s where the Chameleon bootloader resides. Don’t forget to use Disk Utility to reformat the DATA partition to FAT32 so it can be seen by both the Mac and Windows installations. One more thing: for me, Windows XP didn’t activate using the product key from the retail CD. So then I used the Windows Product Key Update Tool to activate Windows XP using the code on the sticker on the bottom of the 1000HE. And another thing, here’s how to fix clock issues after booting into XP after previously booting into Snow Leopard. Thanks again to all of you who’ve written blogs on this, even though I may not have been able to successfully follow all of your steps exactly, but seeing what you’ve taken the time to have written up has been helpful! This entry was posted in Tech and tagged hackintosh on January 10, 2012 by BikingBrian. So this means now that instead of just using MacOS when you have to with the USB stick, youll be able to boot into that OS more often and grow to prefer MacOS over Windows! Will update you again on the status. Many thanks. (1) Use OSX System Update. Most guides tell you not to use System Update but for me, this seems to work at least partially. After update, reboot and replace kernel and DSDT in /Extra. System boots fine with correct graphics but no audio and no onboard (PS2) keyboard and trackpad. Seems easy to fix but not quite. Attempts to install various kexts such as ApplePS2 and Voodoo PS2 failed. My last attempt was somehow catastrophic – system hangs at Waiting for DSMOS. Also check for FakeSMC.kext, which was loaded and reported 17 devices found – so that was not the problem. Also tried chown and chmod on / to set permissions on kext. In the end I had to revert back to 10.6.4 using my Clonezilla backup. (2) Suspecting 10.6.8 update didn’t work well, My 2nd attempt is to try 10.6.7 combo update. After installing and replacing kernel and DSDT, systems boots up and again hangs at “Waiting for DSMOS”. This time now, no extra kexts have been installed manually, so something else must have been causing the problem. 1) Open your netbook and remove the HDD (see video guides on YouTube for example). Connect it to a working Mac with SL, insert the OS X retail DVD and install OS X selecting the (before formatted with one partition) HDD. Run NetbookInstaller as written here, insert the HDD to your netbook back, boot (like written here) and set up your Mac OS X including all kexts and of course the 10.6.7 combo update. 2) Reboot. In Programmes you should find the app “Boot Camp Assistent” somewhere. Start it and follow all steps. If you should get an error that your Mac isn’t supported you need to find a modified version in the web (google with the error). So run Boot Camp, select and make your partitions and follow the steps for the installation. If it will ask you for the Windows CD, use your external CD drive. (I don’t remember the procedure now, if it’s not booting to the XP install after reboot, change the boot priority in the BIOS settings.